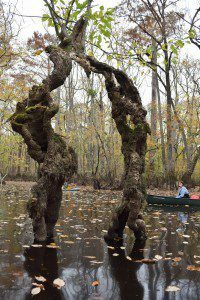 Champion Trees, Notable Trees, and Just Plain Wonderful Trees at Cypress Bridge Swamp! Paddling through the old growth forest with lots of bulbous bald cypress trees, each with their companion knees huddling around them, we could almost imagine ghosts out for the holiday. Someone commented as they squeezed out from exploring the inside of one tree trunk that it was a spiritual moment. Another squealed as she walked in the chilly water and it seeped over the top of her Wellies. 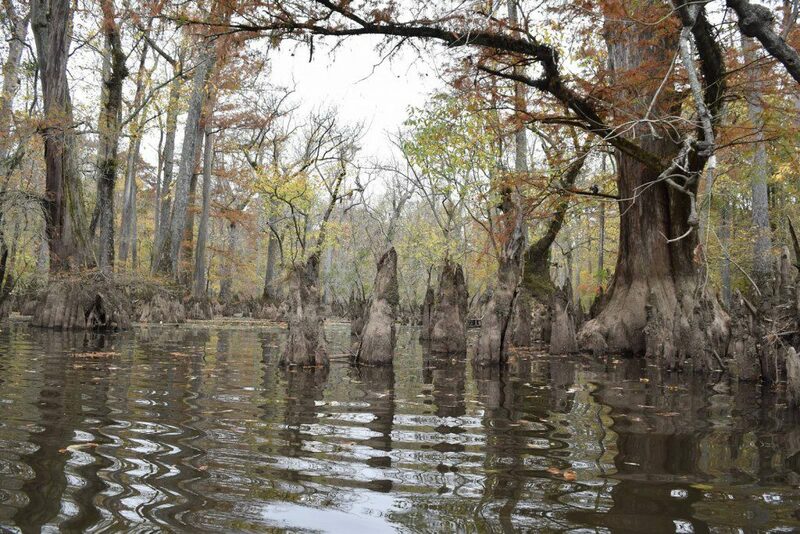 The forest includes not only bald cypress. 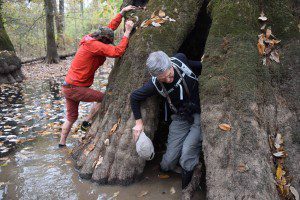 The place abounds with a variety of water-loving trees including water tupelo, overcup oaks, swamp cottonwoods, and Carolina ash. The river birch are nearly all young saplings as the species stages a recovery from hurricane damage that brought down the old birches. The place was spectacular – it seemed like we were in another world. hollowed out trunks like caves and trees with that form arches or play host to other tree species on their massive trunk bulbs. Trees that are hollowed out can’t be cored, so age determination is limited to estimates, but many of the tress may be more than a thousand years old. Being in the midst of this ancient plant community makes it impossible not to be awed by the beauty of ecology.